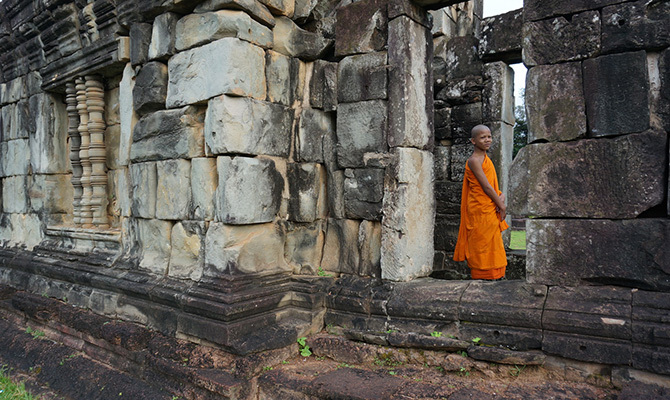 We crafted this journey for travelers who wished to see almost the entirety of Vietnam… with a last minute request to visit the temples of Angkor. Joining together our favorite destinations and attractions of Vietnam with a short hop over flight to Siem Reap, and this Combination Journey was born. Begin this 13-day itinerary in the northern capital city of Hanoi where history, heritage and culture abound. Continue onwards with some down time along the limestone formations of Halong Bay before heading to Central Vietnam’s hip heritage quarter of Hoi An. Top off the north to south journey in the southern hub of Ho Chi Minh where Vietnam’s more contemporary face comes to life. For the cherry on top, hop a quick flight west to Cambodia where the marvelous temples of Angkor await… the perfect ending to a perfect Combination Journey! Upon arrival in Hanoi you'll be met by your guide who will transfer you to your hotel. In the evening, you will enjoy street food with our tour guide. Today you will discover some of Hanoi’s classic visits and hidden gems during a full-day tour of the capital. Start the morning off with a visit to one of Hanoi’s most iconic destinations: the Ho Chi Minh Mausoleum. This grand, monumental structure houses the remains of Ho Chi Minh, Vietnam’s first president and revered leader who liberated the country from colonialism. If there is time, pay a visit to the president’s former home before visiting another of Hanoi’s most classic attractions, the Temple of Literature. The country’s first university, the Temple of Literature is known for its striking courtyards, ancient architecture and deep historical roots dating back over 1,000 years. After the visit, enjoy a delicious local meal at one of our favorite nearby restaurants, serving up classic Hanoi delicacies. After lunch, continue to the iconic Old Quarter of Hanoi. Known for its maze of alleyways and lanes, this section of the city is divided into 36 streets, each which historically sold their own unique products and specialties. Alongside our local expert, discover just what makes this part of Hanoi so unique and charming. Reenergize with a delicious Vietnamese coffee at a local cafe which overlooks the picturesque Hoan Kiem Lake. After sipping the famously strong brew, head to Ngoc Son Temple at the lake’s heart, a must-see site for anyone touring Hanoi. Top off the day with one of northern Vietnam’s most classic forms of entertainment: a water puppet show. Transport will be provided back to the hotel after the performance. After breakfast you’ll be transported out to Halong Bay (3-4 hour ride). One of Vietnam’s most beautiful destinations, Halong Bay, or the Bay of Descending Dragons, is a UNESCO World Heritage Site famous for its limestone karsts and pristine waterways. Upon arrival into Halong Bay (around noon), you’ll be assigned to your traditional “junk” cruise ship where you’ll be spending the evening & following day. Once on board, you’ll be served a delicious (and super-fresh) seafood lunch as the boat makes its way out into the mystical waters of the bay. In the early afternoon you will be brought to some of the region’s most famous sites including the Dinh Huong & Ga Choi Islands, Thien Cung, Dau Go & Sung Sot Caves (the region’s 3 largest) and a pristine white sand beach where you’ll have the chance to swim in the area’s placid waters (weather permitting). Back on board you’ll be able to catch an unforgettable sunset, enjoy another delicious local meal and watch the stars come out as they saturate the Halong night sky. Allow the lapping of water & the boat’s light rocking to soothe you to sleep in your private cabin. Wake up early to catch the Halong sunrise (not to be missed!) and enjoy some Tai Chi on the top deck of the cruise boat to kick off your Day 4. Enjoy a light beverage before heading out to explore some nearby islands via rowboat. After a brief morning tour you’ll return to the junk for breakfast and have the chance to soak in some last minute limestone karsts along Bai Tu Long Bay. Before you disembark, you’ll be treated to a lovely brunch before our transport picks you up and brings you back to Hanoi. Once arriving at Hanoi’s Noi Bai Airport, you’ll board a quick flight to the central Vietnam city of Da Nang. Our guide will pick you up in Hoi An and transport you to your hotel. Visit the Reunification Palace, the Post Office and Notre Dame Cathedral. Your driver will meet you at your hotel and transfer you to the airport for your next destination. Upon arrival in Siem Reap, your guide will be waiting to transfer you to your hotel. In the evening take your first glimpse of the Angkor Temples with a sunset cruise along the moat of Angkor Thom. Board your gondola and glide quietly along the water to the southwest corner of Angkor Thom and the small temple of Prasat Chrung. This small sandstone temple whose name means Shrine of the Angle was constructed in the late 12th century. 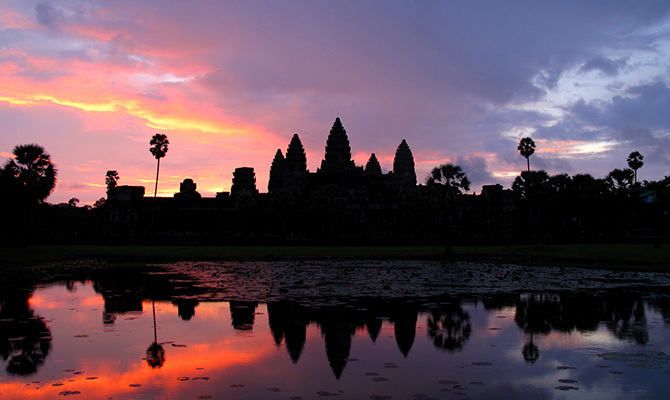 Take along a cold beer or two to enjoy as the sun sets on the majestic temples of Angkor. 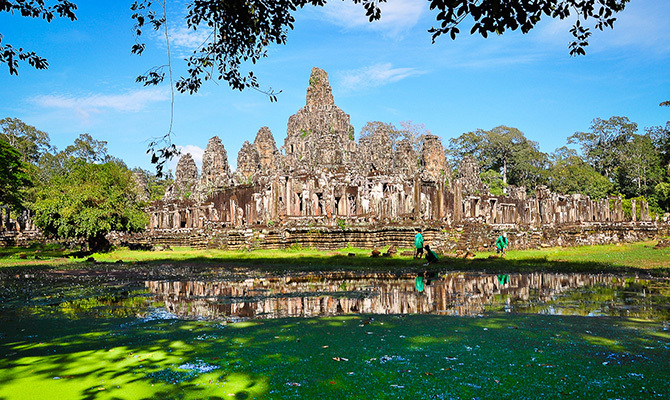 Start your day of exploration with a visit to the South Gate of Angkor Thom where statues of the gods of good and evil line the entrance. 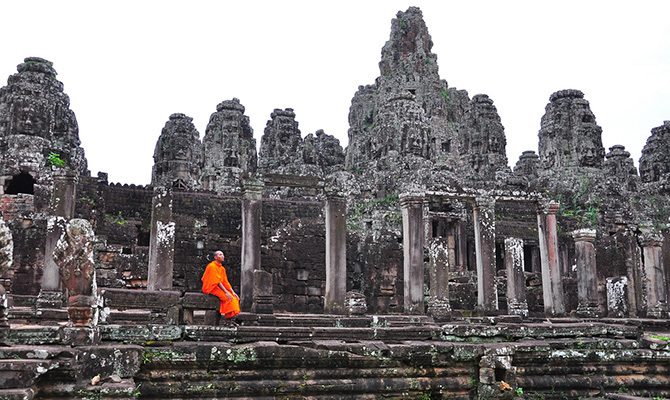 Your next stop is Bayon, known for the hundreds of smiling faces that grace its towers. The bas reliefs are quite impressive and tell stories of daily life and the great battles that were fought between the Khmers and ancient Thais. Move on to Phimeanakas, shaped a bit like a pyramid with two ponds in the rear. The ponds were once used for religious rituals but today serve as swimming pools for Khmer kids. Walk to the top of the temple for impressive views of the Angkor complex. See the rows of trunks that form the wall of the Terrace of the Elephants, a platform from which King Jayavarman surveyed his army. Close by is the Terrace of Leper Kings, which includes a statue depicting Yana, the Hindu god of death. Then it’s a short drive to one of the most loved temples of all - Ta Prohm. This small crumbling temple is held together by giant tree roots giving it a magical feel. Return to Siem Reap for lunch and to escape the hot sun. 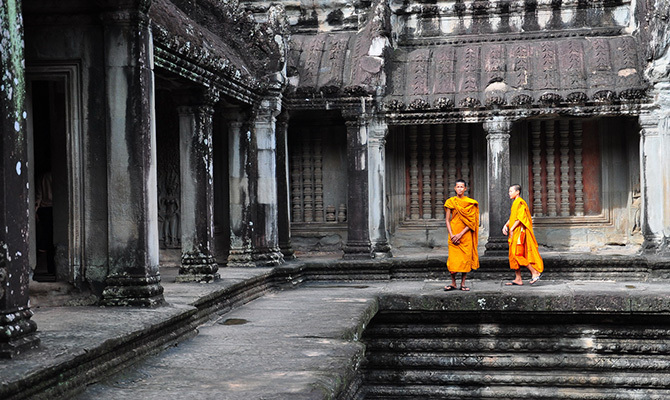 Later in the afternoon explore magnificent Angkor Wat, the world’s largest religious monument. This visually spectacular temple is a massive three-tiered pyramid, rising 65 metres from the ground and crowned by five lotus towers. It’s the national symbol of Cambodia and proudly appears on the country’s flag. Day 13: Embrace your inner explorer as you discover the ancient ruins of Beng Melea, a forgotten and lost jungle temple on the outskirts of the Angkor Complex. It’s about a 2 hour drive to reach Beng Melea. The history of the temple remains a mystery, although it is thought to have been built in the 12th century. Completely overgrown by jungle, the temple has an eerie, abandoned feel. There are fantastic photo opportunities of trees sprouting out of the towers, walls covered in thick green moss and tree roots entwined in the crumbling structure. No restoration work has been carried out and some parts of the temple are inaccessible, however, a large boardwalk with viewing platforms wraps around the temple.